Announcing Cheung, Garney, ACO, Noto, Land, Rosanas and more bringing the story to life! It shouldn’t be too astonishing that the X-Men are as popular as they are. After all, their collection of diverse of mutants offers a never-ending grab bag of super powered mayhem that usually goes toward saving the day–when they’re not too busy butting heads with the Inhumans, that is. Simply put, there is no shortage of classic “X-Men” content and one particular title is about to re-enter the limelight. After a four-year hiatus, Marvel is bringing back the “Astonishing X-Men” series this summer under the confident pen of writer, Charles Soule who’s not too worried that he’s got some big shoes to fill. We’re also excited to announce that Jim Cheung, Ron Garney, ACO, Phil Noto, Greg Land, Ramon Rosanas and more will be bringing the serialized, ongoing story to life with some incredible artwork. Get pumped for the returning title by checking out our interview with Charles who discusses the book’s iconic cast, its use of the entirety of Marvel history and how the series will mutate under his skilled direction. Marvel.com: “Astonishing X-Men” is a title whose original run spanned from the mid-1990s to 2013. What was the most exciting part about being the person responsible for relaunching it? Charles Soule: “Astonishing” is one of the fundamental “X”-titles for me, especially the Whedon/Cassaday run. It’s some of the best “X-Men” storytelling of all time. So, exciting, yes – also somewhat terrifying. But like any book I take on, I’ll do my best. Marvel.com: Over the years, the series was written by a litany of big Marvel creative minds like Joss Whedon, Warren Ellis, Marjorie Liu and Greg Pak. How were you hoping to approach it differently than these writers did in the past? How did you pour your own heart and, forgive me, soul into the writing? Charles Soule: I’d like to think that any story I do will be different from the other incredible talents who have worked under this banner in the past, just because I’m not them. This sort of “Murderer’s Row” legacy isn’t anything new to me, though – from my very first Marvel project (“Thunderbolts”) to Daredevil to pretty much everything I’ve done, I’ve been working on titles that have superstar creators in their past. You just put your head down and write your story and hope that it can stand next to the other books in the line. Marvel.com: Going off that, can you talk a little bit about the artistic vision you had for the look and feel of the series? Charles Soule: I mostly want it to feel epic. I’m trying to go as big as I can both for character moments and “page-feel,” if that’s a term I can coin. I remember when Mark Millar and Bryan Hitch were working in what was termed “widescreen” back on their “Ultimates” project. I’d say it’s something like that, but within every massive beat there’s a character moment (or ten) to back it up. Mostly, I wanted to anchor “Astonishing X-Men” in the real world, so-to-speak. Many times the big superhero stories take place away from population centers, especially mutant stories. I get it – a superhero slugfest with a bunch of civilians around complicates things immensely. I’ve done it myself many times. Setting your battle scene on a remote glacier solves a lot of storytelling problems. However, I think the X-Men are at their best story-wise when they’re not only fighting super-villains, but their activities are seen through the lens of the human world. So, we’ll get a lot of that here – a lot of the action takes place in the heart of London, with all the attendant repercussions. Good times all around. 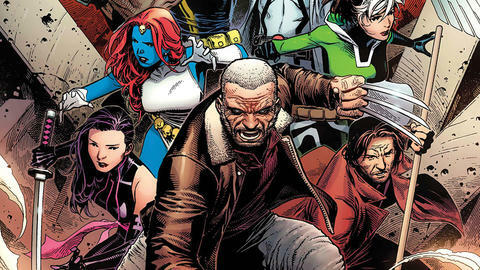 Marvel.com: We know the series will feature a veritable Who’s Who of fan favorite X-Men (i.e. Old Man Logan, Archangel, Mystique, Rogue, Gambit, Psylocke and Fantomex), but what can you tell us about the villains being featured in the story? Charles Soule: Not too much just yet… but we’ll get there! I want it to feel like a nice reveal, but the way the story is designed I can pull in bad guys from literally any era of Marvel history. The book is built like a bit of a puzzle box, with multiple layers of reveals. Part of the fun of certain “X”-stories is speculating about what’s really going on, and this is definitely one of those. Marvel.com: Now onto the heroes. What was the decision process behind choosing these specific characters to make up this team other than being adored by fans and veterans of the original run? Charles Soule: It’s a mix of characters who I really wanted to write and characters who hadn’t been seen in a bit, or both! I wanted a bunch of people I knew I could write well, but who also had lots of history with each other. All of these people have been “bad guys” at one point or another – checkered pasts all around. Many of them have dated each other, or have been in love triangles… it’s just a feast of drama, and the soap opera stuff is part of what makes the X-Men great. It’s fun to write all these folks, especially in a really focused story like I’m telling in Astonishing. The book has a specific point, story and end goal… which you’ll see soon enough! Marvel.com: Will we be seeing a different team dynamic than we’ve seen in the past and were there any specific characters you had a blast writing? Charles Soule: I’ve said this before, but this book doesn’t have a team. It has a cast. It doesn’t have a leader, either. It’s like a novel, or a film, or a TV series. There are characters who are more or less prominent from scene to scene, but this isn’t a story about superheroes coming together with a shared goal to fight bad guys, with a base, and cool coordinated costumes and so on. This is a bunch of flawed, extremely powerful individuals who find themselves in the same place at the same time as something very intense and potentially world-ending happens. Then, we see what they do next. It’s a pretty cool ride, I think.